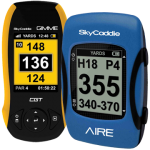 SkyCaddie new Sport Series of rangefinders includes several sizes, formats starting at $129. 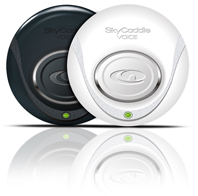 The series includes the SkyCaddie Watch, Gimme, Aire and Voice. All are preloaded with 30,000 course maps and ready to play out of the box. “We realize that there are competitive golfers at all skill levels who insist on every advantage, who want to win every match and demand the very best. For these golfers, we have the #1 rated and most trusted rangefinders in golf with our Tour Series that includes our advanced SGXw, SGX and the new simple, but highly accurate Breeze. And, then there are golfers who play for fun and the sport of game, who want simplicity without compromising reliability. With the introduction of our exciting Sport Series, SkyCaddie now has a rangefinder for every golfer and every retailer’s customer profile. 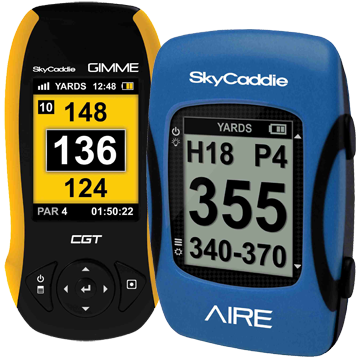 Starting at only $129, we have a SkyCaddie to fit in any format, size and pocketbook, too,” said Richard Edmonson, CEO, SkyGolf. 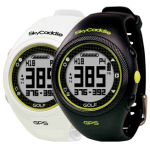 The SkyCaddie Watch at $199 is lightweight and comfortable with a display showing front, center, and back of green yardages. The new Gimme is compact with a hi-res 2.2-inch display that’s readable in sunlight for $169. The SkyCaddie Aire is a mini hand-held device for $129 that can be worn on a belt, hung off a bag or clipped to a pushcart. The 1.8 inch grey scale screen provides front, center, and back yardages plus there’s a calorie counter and odometer. 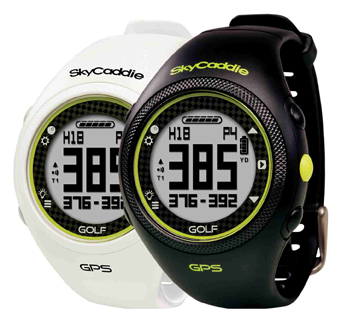 And finally the Sport Series includes the SkyCaddie Voice for $149 which provides distances in a choice of languages.